Large Stone House and Property in Loreto Baja Sur for Sale! In the Historic district of Loreto Baja Sur! Large Stone House and Property in Loreto Baja Sur for Sale, a rare opportunity! If you are looking for a family compound with room for a boat and toys, or a property that could be expanded to be a fishing lodge or place to hold yoga retreats, look no further! This property has it all….proximity to the historic plaza as well as to the Sea, room to expand, and tons of character! Four bedrooms and two baths with a large open kitchen, living and dining room. Built to last out of local stone on city services and a brand new roof. There is 3,000 sq feet of construction on a 1,400 sq meter lot (1/3 of an acre) Room to expand! 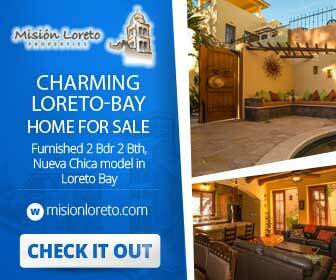 Learn more about this fantastic Large Stone House and Property in Loreto Baja Sur for Sale. Ideal location on newly paved Pipila St one block from the Sea and 1/2 a block to the historic plaza!